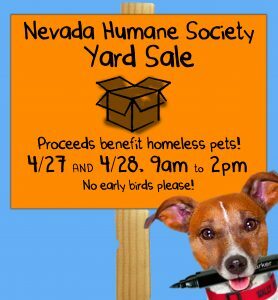 Save the Date for our Giant Yard Sale, April 27-28 – Nevada Humane Society | With Shelters located in Reno, and Carson City, the Nevada Humane Society Caring is a charitable, non-profit organization that accepts all pets, finds them homes, saves their lives, and is recognized as a leader in animal sheltering and stewardship. Want to show your support for homeless animals and get a little shopping done in the process? Then, come on down to our annual giant yard sale on Saturday, April 27, and Sunday, April 28! Kitchen items, glassware, dishes, etc. Many of the pet items include hundreds of varieties of dog toys, food dishes of all sizes and styles, cat and dog supplies (think scoops and clips and more), grooming tools, clothing, pooper scoopers, leashes and collars and so much more! If you wish to donate items for the yard sale, they are only being accepted from April 20 to April 25, between 2pm and 6pm. We will not accept electronics. Nevada Humane Society is open for adoptions seven days a week at two locations from 11am to 6:30pm and an hour earlier at 10am on Saturday. For pet adoptions in Reno, visit 2825 Longley Lane. For pet adoptions in Carson City, visit 549 Airport Road. For more information about Nevada Humane Society, visit www.NevadaHumaneSociety.org or call 775-856-2000.